(UNITED NATIONS) — The first issue that Pope Francis addressed in his speech was the importance of protecting the environment. Climate change and environmental action have been among the common themes throughout this trip. 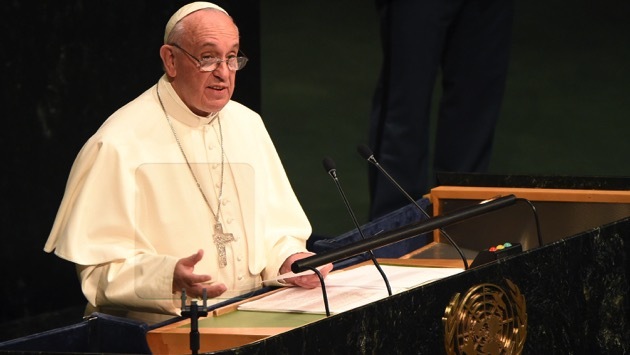 “The ecological crisis, and the large-scale destruction of biodiversity, can threaten the very existence of the human species,” he said, according to a translated version of the speech released by the Holy See. He tied environmental concerns to inequality and the pursuit of power and wealth, which he notably did in his encyclical earlier this year. “Economic and social exclusion is a complete denial of human fraternity and a grave offense against human rights and the environment. The poorest are those who suffer most from such offenses,” he said. The pontiff spoke out against war and conflict, specifically citing the Ukraine, Syria, Iraq, Libya, South Sudan and parts of Africa. Towards the end of the speech, he quotes El Gaucho Martin Fierro, “a classic of literature in my native land,” in order to express how people should “keep a true bond” between one another. The number and complexity of the problems require that we possess technical instruments of verification. But this involves two risks. We can rest content with the bureaucratic exercise of drawing up long lists of good proposals – goals, objectives and statistical indicators – or we can think that a single theoretical and aprioristic solution will provide an answer to all the challenges. It must never be forgotten that political and economic activity is only effective when it is understood as a prudential activity, guided by a perennial concept of justice and constantly conscious of the fact that, above and beyond our plans and programs, we are dealing with real men and women who live, struggle and suffer, and are often forced to live in great poverty, deprived of all rights. At the same time, government leaders must do everything possible to ensure that all can have the minimum spiritual and material means needed to live in dignity and to create and support a family, which is the primary cell of any social development. In practical terms, this absolute minimum has three names: lodging, labor, and land; and one spiritual name: spiritual freedom, which includes religious freedom, the right to education and other civil rights. The ecological crisis, and the large-scale destruction of biodiversity, can threaten the very existence of the human species. The baneful consequences of an irresponsible mismanagement of the global economy, guided only by ambition for wealth and power, must serve as a summons to a forthright reflection on man: “man is not only a freedom which he creates for himself. Man does not create himself. He is spirit and will, but also nature” (BENEDICT XVI, Address to the Bundestag, 22 September 2011, cited in Laudato Si’, 6). Creation is compromised “where we ourselves have the final word… The misuse of creation begins when we no longer recognize any instance above ourselves, when we see nothing else but ourselves” (ID. Address to the Clergy of the Diocese of Bolzano-Bressanone, 6 August 2008, cited ibid.). Consequently, the defense of the environment and the fight against exclusion demand that we recognize a moral law written into human nature itself, one which includes the natural difference between man and woman (cf. Laudato Si’, 155), and absolute respect for life in all its stages and dimensions (cf. ibid., 123, 136). As I wrote in my letter to the Secretary-General of the United Nations on 9 August 2014, “the most basic understanding of human dignity compels the international community, particularly through the norms and mechanisms of international law, to do all that it can to stop and to prevent further systematic violence against ethnic and religious minorities” and to protect innocent peoples. Along the same lines I would mention another kind of conflict which is not always so open, yet is silently killing millions of people. Another kind of war experienced by many of our societies as a result of the narcotics trade. A war which is taken for granted and poorly fought. Drug trafficking is by its very nature accompanied by trafficking in persons, money laundering, the arms trade, child exploitation and other forms of corruption. A corruption which has penetrated to different levels of social, political, military, artistic and religious life, and, in many cases, has given rise to a parallel structure which threatens the credibility of our institutions. 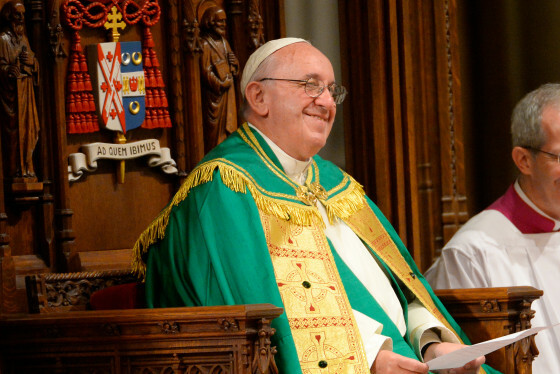 Pope Francis’ U.S. visit includes a visit to New York.